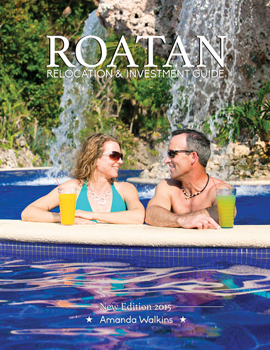 Get your FREE, Roatan Relocation and Investment Guidebook. Roatan is the dream location, where the reality is even better than the dream. The Roatan Relocation and Investment Guide is designed to give you a wealth of relocation and investment information on such matters as Moving to Roatan, Day to Day Living, Residency Requirements, Real Estate Information, Building on Roatan, Going into Business on Roatan and Culture Shock. Each of the detailed relocation and investment chapters have been written, researched, and reviewed by people who have relocated, successfully created and run businesses, worked and profited though investments on Roatan. The Roatan Relocation and Investment Guide supplies you with the insiders information necessary for you to make an informed decision about Investing and Living on beautiful Roatan, Bay Islands of Honduras.